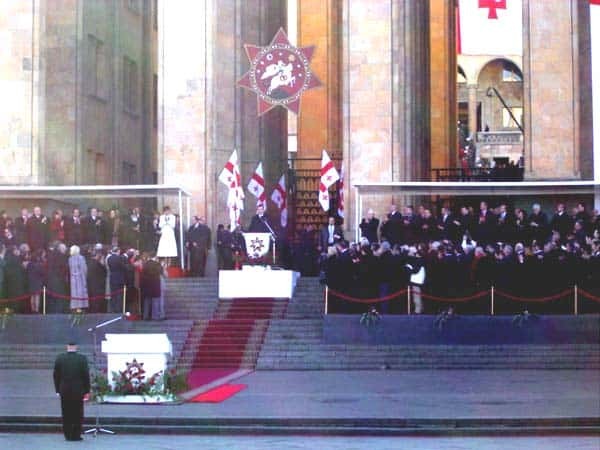 Georgia declared independence from the Soviet Union in April 1991, and problems and instability arose almost immediately. The first President of Georgia, Zviad Gamsakhurdia, governed in an authoritarian fashion and was deposed in a violent coup d’état less than a year later. Eduard Shevardnadze, seen as more moderate, was chosen as Georgia’s second president in 1995. Several bloody conflicts wracked the young country early on, such as a stunning military defeat by a separatist movement in the region of Abkhazia and ethnic violence in the region of South Ossetia. During this time, Shevardnadze’s government faced many charges of corruption and steadily declined in support and popularity. The instability during Shevardnadze’s presidency led to poverty and economic stagnation, which, coupled frustration with the government, led to a widespread desire for change. 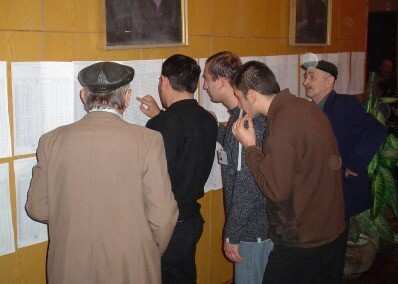 On November 2nd, 2003, elections were held for the Georgian Parliament. These elections were seen as crucial for laying the groundwork for the 2005 presidential election, during which Georgians hoped to elect someone who could move the country forward. 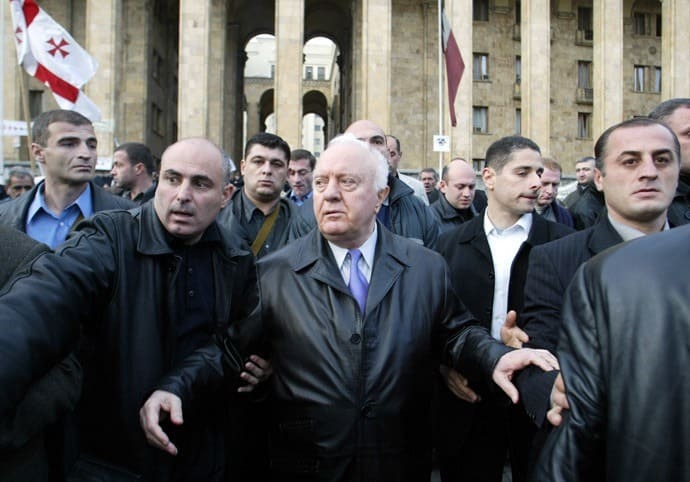 It was suspected that Shevardnadze rigged the elections in his party’s favor, and non-violent protests broke out on November 3, 2003, following the announcement of the election results. This “Rose Revolution,” so called for the roses protestors carried, resulted in the resignation of Shevardnadze and new elections being held the following January. Mikheil Saakashvili (pictured), a prominent politician and leader of the movement, ran unopposed and was inaugurated on January 25th, 2004. Richard Miles served as the U.S. Ambassador to Georgia from 2002 to 2005, where he had a hands-on role in prepping Georgia for the parliamentary elections and observed the peaceful revolution that followed. He discusses his experiences in a 2007 interview with Charles Stuart Kennedy. 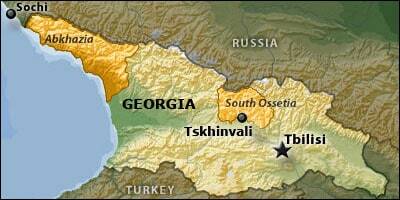 Read about Georgia’s conflict in Abkhazia and Ossetia. Go here to learn more about U.S. efforts to help Armenia during a particularly bitter winter. MILES: Now, I had been in a lot of difficult places, a lot of places—places where there was economic and political malaise, but I had never been in a place in which hopelessness on the part of the population, and even on the part of the leadership, was so palpable as it was in Georgia. Eduard Shevardnadze was the President. He had a good reputation. He had been a tough corruption-fighting communist official in Soviet Georgia as Minister of the Interior and, later, as First Secretary of the Party. And it was on that basis that he rose to national prominence. He was Soviet Foreign Minister in the last days of the Soviet Union and he worked closely with Secretary [of State James] Baker and with the European leaders to help with the peaceful dismantlement of the Soviet empire. Then he had returned to Georgia to help bring Georgia forward into the 21st century. All well and good. He had a lot of friends in the United States, from the President’s father [George H. W. Bush, pictured at left with Shevardnadze] on down, and knew many Senators and Congressmen, and he knew the Western European leadership. We had a good relationship with Georgia but it was clear back in Washington and doubly clear when I arrived in Georgia that, by 2002, Shevardnadze had lost the will to govern and in a certain sense had lost the capability of governing. People were basically just waiting until April of 2005 when his second term would end — they have term limits in Georgia — and some new President, no one quite knew who it would be, would be elected, whether it would be one of the young opposition leaders who had begun to spring up or whether it would be someone from within the apparatus. But people just could hardly wait until that would happen and there might be a chance for the country to move forward. People both within and without the government saw no chance of moving forward while Shevardnadze was President. A most unfortunate situation. In 2002, revenues were hardly being collected. Bills weren’t being paid. The American energy company AES, which U.S. taxpayers had helped to subsidize, was hemorrhaging money because they couldn’t get private consumers of electricity to pay their bills and, in fact, they couldn’t even get the state institutions to pay their bills. The state railway system is an electrified railway system and was actually a money-making operation — it was one of the few money making operations in Georgia since, at that time, it carried much of the crude oil from the Azeri Caspian Sea deposits over to the port of Batumi and on out for sale to Western markets. So it had money but it didn’t want to pay its bills either and Shevardnadze wasn’t willing to make it pay its bills. Even worse, pensions, which, on average, were only $7 a month, weren’t being paid. Civil service salaries weren’t being paid. Teachers’ and medical workers’ salaries were in arrears for as much as two years or more. 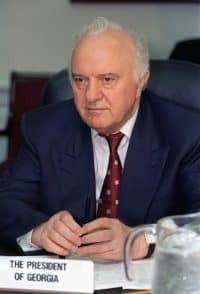 [Shevardnadze] remained in his office and the psychological-political situation was such that neither the Members of the Parliament nor the opposition seemed able to act. In essence, I think they were waiting for the April 2005 elections. There was going to be a parliamentary election in the fall of 2003 and political activists were preparing for that as a kind of a rehearsal for the presidential election. In 2002, people were not really looking for street action nor were they engaged in conspiracies to oust Shevardnadze. They were going through the motions of the democratic system but with the idea that change was still a year and a half or two years away. In 2002, crime and corruption were rampant. You had to pay bribes to accomplish the most simple thing, policemen were not paid basically. A police or Customs Officer job was considered a license to steal. Policemen would buy their jobs from the local police chief or the regional police chief or the Minister, depending on how high up the job was, and he would then buy his uniform and his equipment, such as it was, and then he would collect bribes. Physical conditions in the hospitals, clinics and schools were unbelievably bad. No electricity, no heat, no running water; children and the teachers would have to go out and use an outhouse in the back. Buildings not painted or repaired for 10 years; the windows broken and replaced with a piece of cardboard. Each child, every day, had to bring in a couple of sticks of firewood to fuel the fire in this little tin stove to heat the class room that day. And the teachers, who had not gotten paid in years, were teaching out of simple dedication to their profession. I remember more than once visiting schools and there would be no blackboards. They had been stolen by thieves or sold by the administration or whatever, and I’d ask, “How can you teach mathematics or how can you teach language without a blackboard to write on?” And they said, “Well, it’s not easy.” And they couldn’t buy one out of their own salary because they weren’t getting a salary. It was truly pathetic. 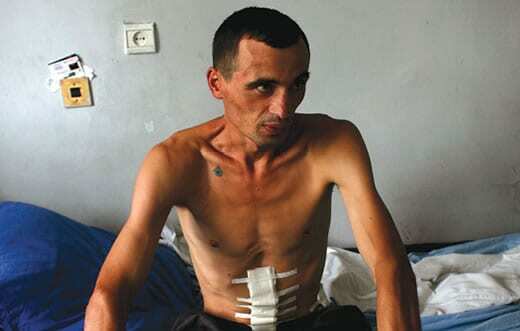 And it was worse than pathetic when it came to the medical system where the same conditions prevailed, where the equipment which had been there, old Soviet equipment, had broken down long ago and was generally not working, and where there was no heat and no electricity and maybe no running water. I mean, it was terrible…. In order to get medical care, you would pay the doctor directly — you’d bribe the doctor in essence to provide you with a little bit of medical care, and your family would bring food for you and maybe a brazier and some charcoal to the hospital ward for a tiny bit of heat. I could repeat that experience throughout the whole society: streetlights burned out and curbs beginning to break down on the side of the roads; enormous potholes in the roads and streets. I suppose I met with Shevardnadze at least once a week while he was President….I always got along with him well but I became increasingly exasperated with his unwillingness or incapability of taking decisive action. Shevardnadze is a real gentleman, he has a certain sense of humor, he is a democrat himself, at least he didn’t have pretensions of grandeur. Shevardnadze was content to work through me rather than trying to establish direct lines of communication to the White House, the State Department and the Congress. I could always see Shevardnadze when I needed to. In his office he didn’t like to speak Russian….And it took me a couple of meetings to realize that the reason was not linguistic nationalism or protocol or anything; the reason was he was tape recording all these conversations so that he could mine those recordings later for his memoirs and he just preferred to do it all this in Georgian. The issue was his willingness to implement the decisions that he had made and by the stage of his career when we were together from 2002 to 2003 he either was no longer capable of implementing unpleasant decisions, unpopular decisions or really unwilling to. He would say to me that he would do this or that and then either he wouldn’t do it or he couldn’t do it. It took me a little while to realize this and, of course, the Georgians had long since figured it out. That’s one of the major reasons why you had this enormous feeling of hopelessness on the part not only of the population, but even on the part of the Members of Parliament, even the leaders of the Parliament, his own ministers, his own personal staff; the feeling of hopelessness was absolutely and totally pervasive and depressing as hell. 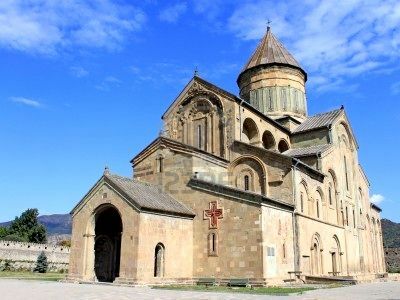 Well, the local governors out there, who were appointed by Shevardnadze, were under pressure from the population and the businesses. As a result, the mayors would send their local police, who nominally were supposed to be controlled out of Tbilisi [capital of Georgia], out to the power stations to turn the power back on. There was obsolete and very inefficient equipment all over the damn place, you could easily electrocute yourself in there—and they would turn the power back on. It was a miracle that no one got killed doing this and, of course, the process meant that no one in his right mind was going to pay for electricity. 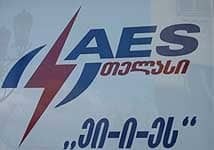 So I asked Shevardnadze to convene a meeting to which he would invite these offending governors, and mayors and representatives of both AES Company and of the USAID [U.S. Agency for International Development]-organized company and his own Minister of Energy and so on. 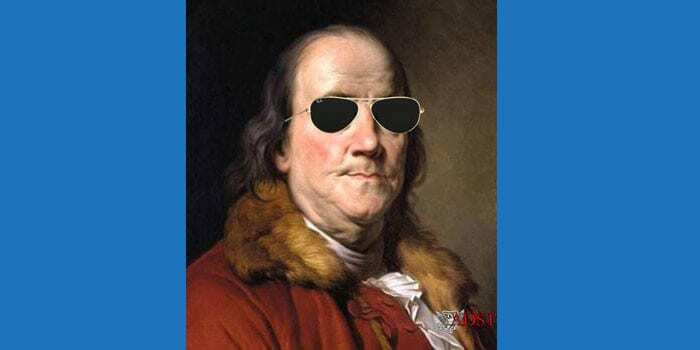 And we all had our say, basically, and then he spoke very sternly to the assembled governors and mayors saying that he had ordered that authority be given to the American companies to rationalize energy distribution system. He made all the right points. The companies have to collect money in order to operate, he said, you must allow these cutoffs and you must encourage the people under your jurisdiction to pay their bills. And they said, “Well, we can’t do that for you, we are simply unable to carry it out.” And that was the end of the meeting. Well, I was stunned. What a hopeless situation! I couldn’t believe it — a virtual collapse of presidential authority right in front of my eyes — and in tiny, little Georgia, a nation of only four and a half million people, for goodness sake. Q: The fraudulent election of 2003 — how did we see that at the time and what happened? MILES: That is what brought the Shevardnadze government down, basically. This was the regularly scheduled parliamentary election. And it’s a real Parliament; it’s not a rubber stamp in Georgia. We felt as the Georgian felt, that the November 2003 parliament election was a rehearsal for the presidential elections in April 2005 and so we wanted to do everything we could to get the Georgian authorities to run an open and honest and decent election. It didn’t have to be perfect but it should be something like our own elections, except for Florida I guess, and we really went at it hammer and tongs. We spent a lot of U.S. taxpayer money on this process — I’ll give some examples. We set up an Election Advisory Committee of all the ambassadors who were interested in this issue and we included the Russian and the Chinese ambassadors if they wanted to come. The Russian ambassador would come from time to time, never did anything, but he’d attend from time to time. I never saw the Chinese ambassador but he was invited…. This wasn’t an American thing, in other words. We involved the EC [European Commission], we involved the UNDP, UN Development Programme people there, we had the European Commission representative, we got the British and the others to provide a fair amount of money. We organized a massive campaign to rectify the voter registration list. In Georgia this had all been done on pretty much a precinct by precinct basis across the whole country, over a million and a half voters. And the voter lists were all organized on a precinct basis, often on the basis of a handwritten list. That list was just a bloody mess and so through USAID we rented a huge, vacant building, like a gymnasium; we filled it up with tables and chairs, computers, of course, and then we hired a small army of young people who would sit and type these lists precinct by precinct into the computer in a way in which you could cross-check names. And these corrected lists were then posted on the Internet and were available in written form, available in the election commissions all around the country so that individuals could go and see whether their name was on the list or not….So the result was a pretty useable list. That cost over $1 million; I think $1.8 million or something to do all that. Now, I have to confess that, in the end, these lists were often ignored by the various election commissions — they preferred “their” lists which were easy to manipulate. But where you had a more progressive set of local election officials or a certain balance in the local electorate, then the lists were a wonderful asset. We provided training, which we do in a lot of countries, but we did a lot of it in Georgia. It didn’t matter which political party — the government party, the opposition parties, the radical parties — we would provide training for them, for election workers, even for people working in the political campaign. How do you run a political campaign? How do you organize a political rally? And so on. How do you do media? We organized working visits to the United States but we also had U.S. experts coming to Georgia. We had a leading American expert on exit polls come to Georgia and help set up a professional exit polling system for Georgia so everyone would have a rough count of how the election was looking as the day went on. This proved quite valuable when I had my conversations with Shevardnadze after Election Day. Oh my, it just went on and on, anything we could think of that would make this a good election, we would do it. I went around and of course talked to the government people a lot but I also went around and talked to the opposition leaders and even to some of the more corrupt regional members of the government to say, “This is very important, we are putting a lot of stock in this, you could lose your reputation in this election or you could make your reputation, depending on how you run the election in your little part of Georgia,” whatever. And they would say, “Yes, we understand, we’ll do our best.” Now, no one is going to say to the American Ambassador, “No, we’re not going to run an honest election. We’re going to employ every dirty trick in the world to steal this election.” But I figured, nothing ventured, nothing gained. I’m going to make sure these fellows know that we’ll be watching on Election Day and that, maybe there will be a reckoning depending on how things work out. Meanwhile, the ambassadorial Election Committee had been meeting once a week for almost a year and there were subcommittees, by the way, which would meet on more technical issues. But the icing on all this huge cake of preparation for the election came because of an impasse in the selection of the members of the Central Election Commission, which was to oversee the whole election process. There was an impasse caused by the inability of the government and the major opposition parties in the Parliament to agree on the composition of the Central Election Commission. Certain follow-on steps couldn’t be taken until the Commission was formed and we were approaching a point at which the election itself might have to be postponed. 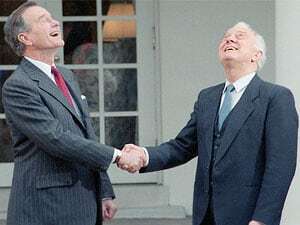 And so in talking to Washington about this we agreed that we needed a hired gun to come out here and bring some sense to this because time was running out and so, very wisely, Washington decided that they would ask Jim Baker [pictured with Shevardnadze in Washington, 1990] to do it. 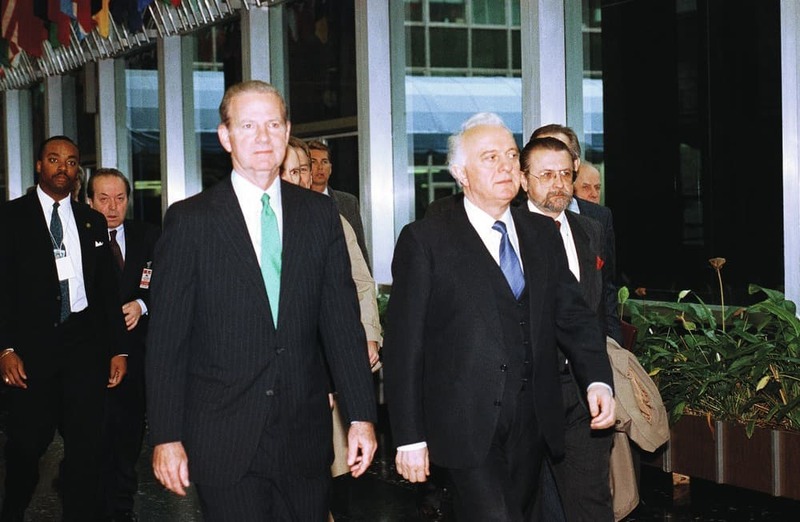 Baker had been the U.S. Secretary of State during the time when Shevardnadze was the Foreign Minister and they had worked very closely together. They knew each other well, they respected each other, they were on a first-name basis. He was an excellent, even a perfect choice. Well, he came out with a very small entourage. He met twice with Shevardnadze and twice with the opposition. Final resolution was reached at an 8 o’clock in the morning meeting on a Sunday, which is something that Georgians don’t do; they aren’t early morning people and damn sure on a Sunday they’re not morning people. And Baker said, “Yes, Eduard, that’s it, exactly.” And that in fact did sum it up. And off Baker went, having accomplished quite a lot, and we continued our work. Then Election Day came. And actually the first returns on election morning indicated that things were going smoothly but then it got worse during the day and it was clear that the election wasn’t going well. The exit polls showed that the opposition parties were winning the majority of the seats in the Parliament, not one opposition party but two or three opposition parties, which all together would have developed a majority in the Parliament, and Shevardnadze’s government party was coming in third or fourth and so they would have been relegated to a minority position in the Parliament, which they controlled up to that point. The situation got worse during the day and meanwhile there were 600 foreign observers there in a country of four and a half million people; that’s a lot of observers. And they issued a scathing report. My own people reported some of the weird things which they had seen. I went out and looked at a few polling places myself; it was just a debacle. It was too obvious, too massive, too well documented by the foreign observers and the Georgian observers, too much at odds with the rather scientific exit polling which had been done, and he ran up against a very determined and dedicated and intelligent opposition in the form of [Mikheil] Saakashvili, the [future] President, but also backed up by Nino Burjanadze, the Speaker of the Parliament, and by Zurab Zhvania, who later became Prime Minister, who had been in the government before and had fallen out with Shevardnadze. 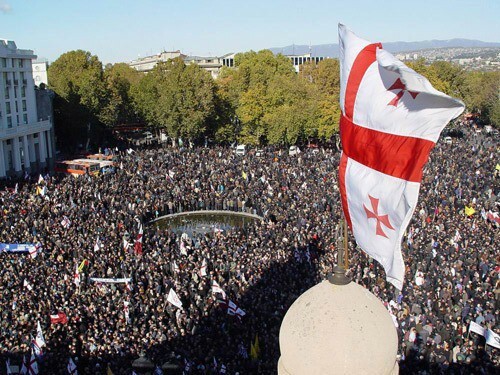 And the three of them called for a rally of their supporters down in the main city square of Tbilisi. A lot of people turned out, and to make a long story short they stayed for a month down there during very bad weather; this was already November. Tbilisi has relatively mild winters but it does snow and blow and it can get pretty damn cold and unpleasant. And the people stayed through all that. The organizers were very good at changing the venue slightly, bringing in entertainment, declaring, “Okay, we’re going to take a day off. Everybody go home and have a shower and a hot bath if you can and drink some tea and come back the next day and we’ll do this again” and so on. And Shevardnadze just wasn’t willing to compromise. You could have a recount, you could have a rerun of the whole election, declare the whole thing null and void, rerun the election…However, it quickly became clear that the opposition leaders and the demonstrators on the street were more interested in forcing Shevardnadze’s resignation than in correcting the results of the parliamentary election. Now this was not something which Saakashvili or anyone else had ever talked to us about. Saakashvili, in contrast to the other leaders of the opposition, had immediately called for Shevardnadze’s resignation. 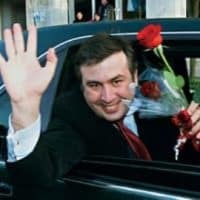 Now, this was a parliamentary election and, logically the Georgians really should have focused on correcting the parliamentary election and worried about the presidency later, because after all the presidential election was set for April 2005 —only a year and a half away. But Saakashvili saw the moment and in an astute, if demagogic, political move, began immediately to call for Shevardnadze’s resignation. Neither Burjanadze nor Zhvania had planned to appear continuously at the demonstrations downtown. But they simply couldn’t break away —the demonstrations were simply too big and too enduring — so they began to reappear more frequently than they had planned. People were already fed up with the Shevardnadze administration. They were unhappy over the poor collection of revenues, the abysmal state of the infrastructure, the failure to pay salaries and pensions and the increase in crime and corruption, and they responded to Saakashvili’s repeated demand for Shevardnadze’s resignation and so there began to be increasing pressure on Shevardnadze, not just to rectify the election but to resign. And we ambassadors talked to him about various possibilities, but he was simply unwilling to admit that the election had been flawed, let alone to talk about steps to make it right. I really believe that a compromise could have been found rather easily but Shevardnadze’s intransigence only fed the anger of the mob. All during this considerable Sturm und Drang, violence was avoided and if I did one thing during that post-election period, it was to try my best to keep both the government people, especially those who had authority over men with guns, and the opposition leaders committed to non-violent measures and counter-measures. I spent hours talking to them about what was going on and an almost equal number of hours talking to the leaders of the demonstrations about the importance of keeping down hooliganism. I would say, “You don’t need a lot of broken windows; you don’t want police cars overturned and burned and that kind of thing. This wouldn’t look good on television” — and, by then, all the international print and TV media were represented in Tbilisi. In the end it was quite non-violent, quite bloodless. This was the Rose Revolution. It was a major political development and all achieved bloodlessly. [The roses were] a kind of a gimmick, actually the idea of Mark Mullen, of the National Democratic Institute. I expect he was as surprised as anyone to see the way in which this became the symbol of the democratic movement in Georgia. But it was designed to demonstrate the non-violent nature of the opposition. Amazing, the over-sized role such gestures can assume. There were rings of uniformed police and internal troops around the Parliament building and with corresponding levels of weaponry. So you first would have policemen with linked arms and then you’d have policemen with shields, plastic shields, and then you’d have policemen with clubs and batons and then you’d have guys with guns. 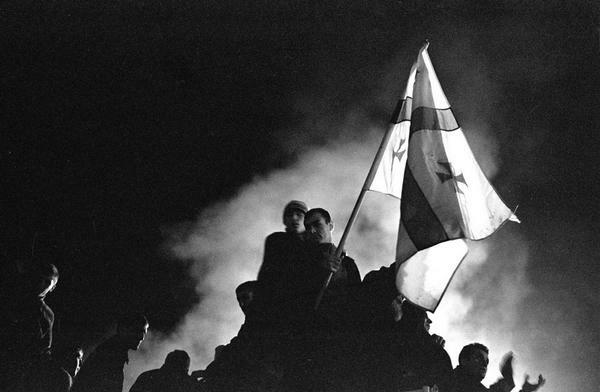 And as the opposition leaders approached the Parliament, and Shevardnadze was already in there speaking, the ranks of the uniformed policemen opened like Moses parting the Red Sea and the demonstrators poured into the Parliament building waving their red roses and declaring that this is an illegal Parliament and people should disperse and go home…. Shevardnadze was hustled out by his security guards, Saakashvili took the podium, the rostrum, and ceremoniously drank the tea out of Shevardnadze’s glass that had been left sitting there on the rostrum and declared that the people have taken power, or whatever, and then everybody went home. They actually stayed around the building for a while but basically they went home. Saakashvili had refused to meet with Shevardnadze anymore because he felt Shevardnadze was living in some kind of political Never Never Land and wasn’t being realistic and, in turn, Shevardnadze refused to meet with Saakashvili because he felt he wasn’t being respectful enough and was rude and impertinent. And they both were right, of course, but still life has to go on. I had been meeting with Avtandil Jorbenadze, the State Minister, something like a Prime Minister, and I remember the last time we met. Jorbenadze asked me what was going on in the talks between the opposition leaders and Shevardnadze. And Jorbenadze said he had no idea. And about that time Russian Foreign Minister Ivanov decided that he’d come to Tbilisi to see what he could do to help sort things out. The Russian Ambassador and I arranged for Secretary [Colin] Powell to call Ivanov at the airport as he landed. The Secretary used some talking points that we had provided, suggesting things that might be helpful in this situation, noting that the Patriarch of the Orthodox Church had been a very useful player in this process, trying to keep the situation non-violent. The Patriarch had to mediate and had offered the venue of the Patriarchate [pictured]. If Shevardnadze and Saakashvili couldn’t meet at the President’s office, maybe they could meet at the Patriarchate. The Secretary told Ivanov that if he needed any help from the American Embassy, he should just let the Ambassador know and we would be perfectly happy to help. It was quite a friendly gesture, I thought, and I think it was taken in that way by the Russians, although they then totally ignored it. Ivanov was able to convince Saakashvili to join in a meeting with Shevardnadze. And when the three opposition leaders went in to see Shevardnadze, Ivanov went to go in with them and the opposition leaders said, “This is a Georgian affair now; we thank you for bringing us all together but we won’t need you in this meeting.” That was really a great Georgian put down. Ivanov then flew off to Adjara, the autonomous province of Georgia on the southern Black Sea coast run by a little tin pot despot down there named Abashidze. So Ivanov flew down to brief Abashidze about what was going on and while he was down there the news came that Shevardnadze had announced his resignation. Now we all thought that that was an increasing possibility but I don’t think that any of the foreign diplomats, much less Ivanov, thought that was going to happen at that moment and so we were all taken by surprise. That evening, as usual for the past month, there were tens of thousands of people out in the streets of Tbilisi. This was late at night; I was at the Embassy with the team, and you began to hear this roar. We were close enough to where the people were to hear the roar of the crowd and at the same time they were broadcasting the news on the TV and on the radio and simultaneously, and I don’t know what insightful civil servant had thought about this, but fireworks broke out. I mean, I’m talking about the kind of big fireworks that you have on the mall here on the Fourth of July. So some guy in the parks department had somehow managed to get his hands on some very serious fireworks and the instant that resignation was announced, poom, off into the air went these fireworks. It was a pretty amazing thing, really. We were very supportive of the new government. In accord with Georgian law, an interim government was formed with an acting President. The troika, Zhvania, Saakashvili and Burjanadze, met and had agreed that Burjanadze would become the acting President. Nino Burjanadze is the woman who had been the Speaker of the former Parliament. So she would become the acting President during a 45-day period. [There] would be a unified candidate and that would be Saakashvili for President in 45 days according to Georgia law. Burjanadze told me at that time that she thought that either she or Zhvania would make the better President but that the political moment belonged to Saakashvili and they were not in a position to deny the office to him. I said, “We’ll do what we can to help,” and then I passed this on to Washington immediately. Because Georgia is a small country one didn’t need a whole lot of money to do this and Washington basically scratched the bottom of the various assistance barrels for every penny they could get their hands on and they came up with — I don’t remember the exact figure, but it was like $21 or $22 million of assistance and much of that is what they call bridging assistance, which is basically cash that you give to a foreign government. But because of the emergency situation the Congressional leadership agreed we could do this. I mean, everything they could possibly pull together they did. And it was enough to help the government to survive that first 90-day period. It was very useful. And then after that, because the government immediately embarked on a serious reform program, and I’m not saying they did that perfectly…but it was so vastly superior to what the Shevardnadze government had done that there was no question that we would support these efforts and would be very helpful to them in the process. So we began doing things that we would not have dreamed of doing before with Shevardnadze. Because the police were so incredibly corrupt and incompetent we had never provided any kind of police training to them of any sort. We pretty quickly began providing training to the Ministry of Internal Affairs.